That I managed to completely, um, misinterpret? (Yeah…misinterpret ☺, that’s how I’ll describe it.) And now, as a result I am left with nearly six pounds of uneaten granola (in the form of one really big granola log) that even the dog turns his nose up at. And no, mom, this isn’t like the “apple oatmeal cookies” incident of ’02 when I tried to substitute butter with applesauce, or the “Valentine fiasco” of ’98 (apparently you put the red hots’ in the sugar cookies AFTER you bake ‘em); No, this time I actually attempted to follow a recipe given to me by Mr. Engineer Boyfriends’ Lil’ Sister (MEBs – note, the little ‘s’, pretty creative, huh?). 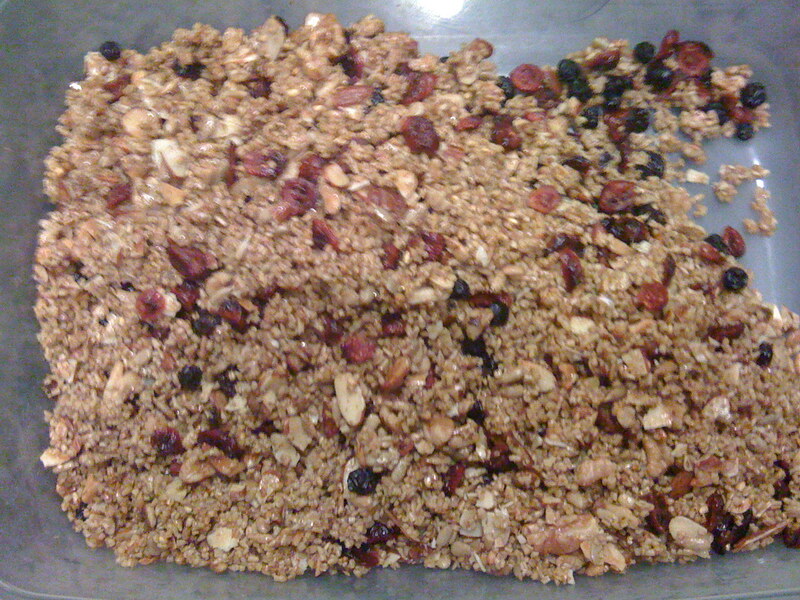 It’s just that when she made “the granola”, it was edible; when I did it, well, see picture below (paying particular attention to the un-flake like consistency of said granola). The problem lies with the recipe. You can see below that the recipe calls for ‘oats’. Nowhere does it specify the specific shape, size, consistency or brand of ‘oats’ and so as I stood in front of the two aisles of ‘oat products’ at the local Trader Joe’s I was awarded a bit of ‘creative license’. Never a good thing — at least for me. So while I have later been told I should have gone with the standard Quaker Oats, I decided to go all European and chose something called “Scottish Steel Oats”. Apparently all oats are not created equal and this little ‘shout out’ to the motherland resulted in the demise of my granola. So while I can’t blame IBM’ for this one (or maybe I can, there must be a way…please hold ☺ ) I will have to go for the next best thing, none other then Mr. Engineer Boyfriend. (who can’t cook to save his life either) I mean guilty by association I guess. I am including the recipe here in hopes that you will have better luck then I had. And yes, I know it is completely ridiculous to “make your own granola” when you can go out and buy the stuff on just about every street corner for half the price of just one of the ingredients listed below. (And, might I add, not have your kitchen cabinets chock full of eighteen pounds of dried cherries! Damn you Costco!) But it’s all about the experience. And making sure that no one tries to spike your granola with a little bit of coconut. Yuck. Total yuck. Like why not just lather the stuff with mayonnaise. Gross. Oh, and while I’m at it. I should confess to the fact that yes, MEB, I’m the reason why there is now a thin layer of plastic caked on the inside of the microwave. Oops. No one told me I had to take the microwave popcorn out of the plastic before I nuked it. You said, “just throw it in there for 2:30”. So I did, just as I was told. Next time it’ll be different. Toss the oats,almonds,cashews,sunflower seeds together. (Don’t include the dried fruit). Whisk the oil and honey together. Mix together until all the nuts are covered and throw in some extra honey for good measure. Pour onto a 13×8″ baking sheet covered with parchment paper. Bake at 350 stirring occasionally until golden brown. (20-30 mins). Allow to cool and throw in the dried fruit. Fingers crossed and hope for the best!